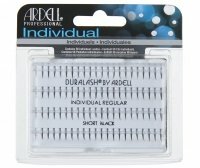 INDIVIDUAL DURALASH KNOT-FREE NATURALS SHORT BLACK by ARDELL. 6 sets of black lashes in natural black color. 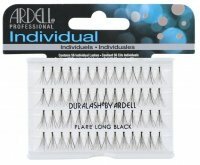 Thanks to them you will increase length and density of your natural eyelashes. The product can be used repeatedly. It provides great and reliable finish of any eye make-up. There are 6 sets available. These are the shortest tufts available. They are perfect for daily make-up. The set was placed in a paper box. KNOT-FREE NATURALS SHORT BLACK - the shortest tufts in a knot-free version.